I was so excited about visiting winemaker Mitch Cosentino at his new tasting room! I’ve tasted his wines every year for the past few years here in Santa Clarita but had never visited him. And his new label, PureCru, has a new perfect pairing: a wine tasting bar (which means it’s open at night too) in downtown Napa. “A Winemaker’s Wine Project: A unique company and brand originally and principally built around one wine. 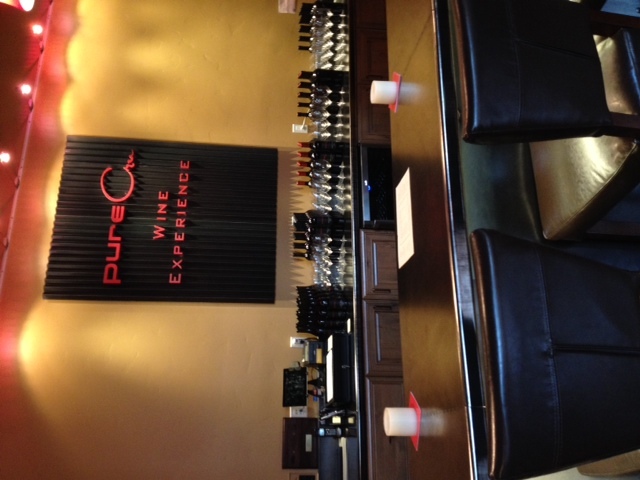 Any wine from pureCru wines will be designed for the fine cuisines of the world by Winemaker/Founder Mitch Cosentino. While Napa Valley is to be the prime area of grape sources, we will not be limited to Napa. Great fruit from great vineyards without limitations is the only fruit this company will use in any wine. Cosentino said this wine was similar to his wine The Novelist and modeled after Haut Brion Blanc ($1300 a bottle). There was no malolactic fermentation – which allows these whites to age. Honey, apricot, pear, pineapple, mown grass; crisp but without that clinging acidity associated with so many Sauvignon Blancs, sharp lemon zest, kiwi, and some light oak. Brightness comes from the Sauvignon Blanc and roundness, per Cosentino, comes from the Semillon. Cosentino said this was styled like an old Chablis using an old Meursault clone, 100% barrel fermented on the lees, no malolactic fermentation so the creaminess is from the stirred lees. Used 40% new oak by a French cooper – personally designed for Cosentino after visiting him. Cosentino said that one-year-old French barrels are the best to use as they’re not as strong. Cheddar, Ritz cracker, Granny Smith apples pulled from pies; Bright, lemon, grapefruit, creamy oak and long finish. Made through a co-operative with the grower, they skipped 2011, next vintage will be 2012, and there are less than three cases left of this wine. “Color on Pinot Noir is like clothing on a woman – not needed” an old quote that originated in France and repeated for fun by Cosentino. Suede, strawberry, trimmed trees; bright, taste-bud-standing, balanced finish with the slightest hint of strawberry. 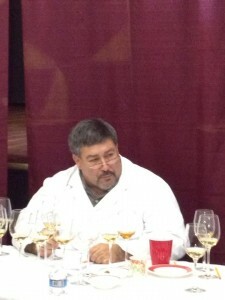 Has received several gold star medals, as many of his wines do: Orange County, San Francisco, etc. The wine is made like a Brunello with a third year in barrel, and blended like a Super Tuscan. A $28 bottle of wine – a price Cosentino can do even with all that time using up space and barrels in the aging! Chocolate covered black cherry cordials, one-day old spaghetti sauce (the way it should be served), milky chocolate; balanced, dry, great black cherry and smoke finish. This was my favorite. Black and blue fruit bowl, chocolate, cigar; plentiful red berries, red currant, cigarette. I’d like a little more age on it, Cosentino said the same. 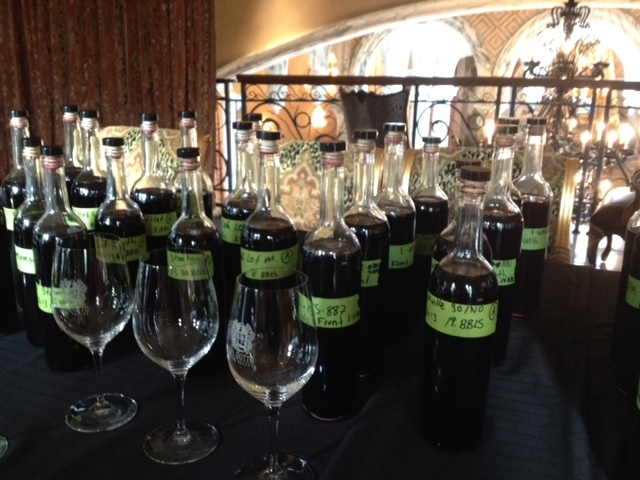 Cosentino has been the longest continuous producer of Cab Franc in the valley, since ’85. In this vintage Cosentino said that the Cab Franc is the most dominating and spicy, Merlot adds spice and texture. Just released after August 2013 bottling. Mocha, sugar-dusted cherry and plum, wet leaves; bright yet smoky, fruity yet chocolaty, tasty, maybe a little more age…or just go for it! Another favorite. 47% Cabernet Sauvignon, 20% Cabernet Franc, 19% Merlot, 14% Sangiovese. Designed to fit the palate and cuisine of Chef Michael Chiarello and his restaurant Bottega. Chiarello tasted it and agreed that it was like his cuisine. He was the first one to get the wine, and this year it was only available at his restaurant. Cosentino said it has the “magical fourth dimension” of Sangio to add red fruit to a black fruit Bordeaux. Cosentino called it a Meritage Plus, explaining that this “fourth fruit fills all the points of the mouth” and is very close to a super Tuscan. Designed to be its own specific deal, he said, and the Sangio fills in the mouthfeel. Silky dark fruit, cinnamon, milky chocolate dusted red berries; balanced pepper and red ripe fruit, mid palate drying while ripe fruit rotates pleasantly around your tongue, tingling finish. Very nice. Most awarded Meritage wine of all time, his first vintage was 88. Near perfection, balanced fruit and tannins, want with lunch…now would be good. Mitch said it’s broad on the palate. We had to have this one to take home too! Mitch says is smells and taste like Christmas! Juicy red to black fruit, green pepper; chewy, good to drink now, not as dry and dark as other Petite Sirah. Conclusion: If you missed a Cosentino sighting in Santa Clarita Valley this year, don’t fret, order straight from his website. 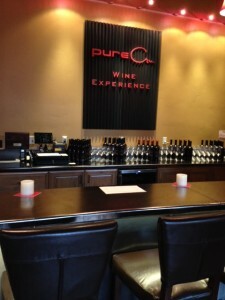 Or go to the tasting room in downtown Napa and taste it all like we did! 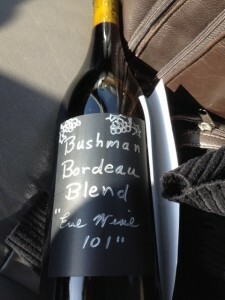 The wine was a gift for review from the winery representative and I tasted about a month before my visit. Heavy bottle with a heavy punt made me think, this would be a heavy-duty wine. The color was of deep garnet in the center of my glass, a bit of a burnished edge. The aromas reminded me of sweetened dark plum, blackberry, blueberry, cigar and simmering beef stew. 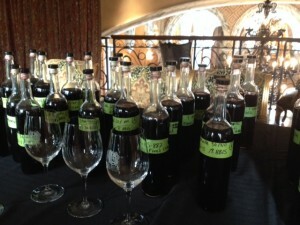 Once tasted I got flavors of dried blue and black fruits, cracked pepper, black licorice, very dark chocolate and earth. 90 Eve Points easily. Admittedly, my wine knowledge is pretty focused on California. So, when I get an opportunity to add to knowledge outside of my primary area of expertise, especially when it is in a great environment, I do my best to jump at that. 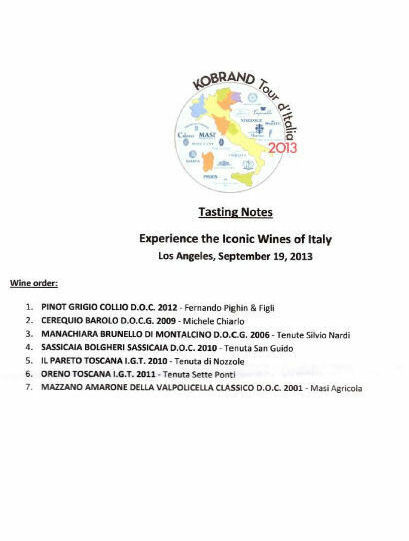 The Kobrand Tour d’Italia 2013 wrapped up its eight-city tour at the Hotel Sofitel in Beverly Hills on September 19th. I had the pleasure to attend the guided tasting entitled: Experience the Iconic Wines of Italy. Upon entering the room, we were greeted at our seats by seven glasses of wine – one white and six reds. We were also greeted by who was to be the moderator of the panel discussion, Jennifer Simonetti-Bryan. 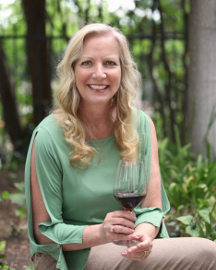 Ms. Simonetti-Bryan became only the fourth woman in the United States to achieve the prestigious Master of Wine designation. She told me she started out in the banking industry – possibly that’s what drove her to drink (just like accounting probably influenced me)? Ms. Simonetti-Bryan discussed Italy’s rich wine heritage, which is over 2000 years old. She mentioned that, while wine is of course still hugely popular in Italy, per capita consumption is down and that, in total, more Italian wine is consumed in the US than in Italy. She then went to introduce the wineries and the individuals representing them. For the most part, the wineries were all family-owned and the representative was a family member. Wine #1. The first wine, as indicated, was a Pinot Grigio, and the only white wine we tasted. It was much more complex and flavorful than that mass produced one that is so popular. Wine #2. This wine was 100% Nebbiolo and had been barrel aged for two years with an additional 15-16 months of bottle age before release. Wine #3. This was the last Italian varietal until #7. (#4, #5 and #6 are Super Tuscans, a term given to Italian wines made with French Bordeaux varietals.) I wish California Sangiovese could taste like this. Wine #4. As I mentioned above, we are in Super Tuscan territory now. Actually, this winery pioneered Super Tuscans, having first produced this wine in 1968. Wine #5. This might have been my favorite wine of the day, maybe because I found it to be the most “California” in style. I know I am showing my own geographic prejudice here, but so be it. Although, see #7 below. Wine #6. A classic Bordeaux style blend from Italy. Wine #7. Back to Italian varietals to end the seminar with a great flourish. Amarone is made with dried grapes, and the flavors were intense. Tied with #5 for my favorite. 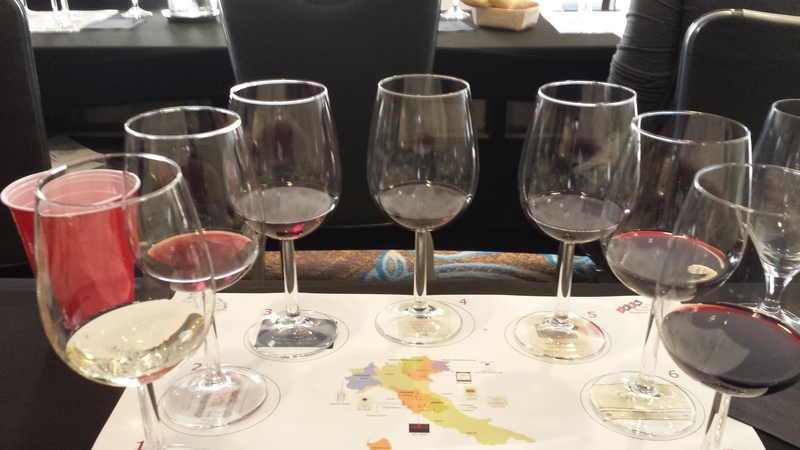 This was definitely a great way to learn more about Italian wines. Sometimes, it is a good idea to venture out of your comfort zone. Toscana is arguably Italy’s most renown wine region. It is also the homeland of antiquity’s Etruscans, who in turn, greatly influenced the Romans and their culture. Tuscany is rich in history, culture, art, and scenic landscapes that are filled with rolling hills and some of the world’s finest vineyards. Tuscany is not only the birthplace of the Italian Renaissance; it is the home of the prestigious “Super Tuscan” wines. So what exactly is a “Super Tuscan?” The primary characteristic is that these wines must adhere to a minimum of 85% of grapes grown in Tuscany. It is also important to note that the local vintners oftentimes do not use Sangiovese as the dominant varietal. Bordeaux grapes such as Cabernet Sauvignon and Merlot are popular choices. The wines are made in the international style and aged in new French oak barriques. The finished wines are filled with plenty of robust fruit, and lose none of their Italian soul. Due to their strong acidity, Super Tuscans are better served with food. Tignanello, Solaia, Magari, Ornellaia, Picconero, and my personal favorite, Sassicaia, produce some of the most notable and expensive wines. Today I am joined by my very special friend and fellow sommelier, Serena Dutto. We are in the historic city of Siena, at the Plaza del Campo. It is a warm summer day and we are thankful for the shade provided by the ominous Torre del angio (Mangia Tower) that is looming above. Can’t afford the famed Ornellaia at $200 per bottle? Then go with the next best option, Le Serre Nuove. This is Tenuta dell’ Ornellaia’s second label. Serena selected a Le Serre Nuove Bolgheri 2005. This dark reddish purple wine combines the smooth juicy plum fruit of Merlot (40%) and the structure, cassis, herbal notes of Cabernet Sauvignon (40%). The remainder is 15% Cabernet Franc and 5% Petit Verdot. This is a full-bodied wine that is supple and fresh on the palate. The alcohol content is 13.5% with a price tag of $55. “This wine is rich in tannins and will pair nicely with the heartiest of red meats,” Serena nodded in assurance. Our next selection, Villa di Capezzana, Ghiale della Furbe 1998 hails from the Carmigano district, a relatively small area just outside of Florence. This wine is a wonderful example of a Bordeaux style wine. 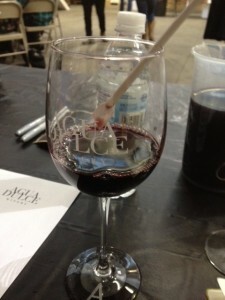 It is a blend of 60% Cabernet Sauvignon, 20% Merlot, and 20% Syrah. What makes this wine exceptional is that the Bonacossi family was able to combine the fruit and roundness of Cabernet Sauvignon, with the elegance and suppleness of Merlot and Syrah. In color, it is a deep ruby red with purple hues. This nose is filled with an array of cassis, black cherries, sage, and chocolate. This is definitely a full-bodied wine that is abundant in formidable tannins. The alcohol content is 14% with a price tag of $55. “Half a case for now, and lay down the other 6 bottles,” Serena flashed me an almost mischievous grin. 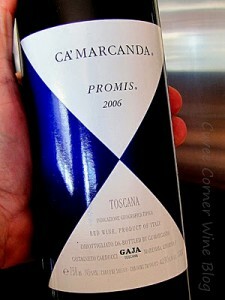 Our next selection, Gaja Ca’Marcmanda Promis 2006 hails from Tuscany’s coastal district of Maremma. Over the years, the Gaja name has become synonymous with producing elegant and opulent wines. Our wine proved to be up to Gaja’s stringent standards. The 2006 consists of 55% Merlot, 35% Syrah, and 10% Sangiovese. On the eye it is a deep dark red. The nose is filled with generous amounts of dark ripe fruit. This is a wine of quality. On the palate, it is well textured and balanced. The overall experience is one of grandeur without paying a king’s ransom. The alcohol content is 13.5% with a price tag of $50. “They definitely found the mark with this one,” I flashed Serena an even grin. Overall, I find this to be a most delightful and elegant wine. Vino California – contrary to its name it’s actually a celebration of Italian wines, some available at your local BevMo, some still looking for an American distributor. And it had to be a celebration. 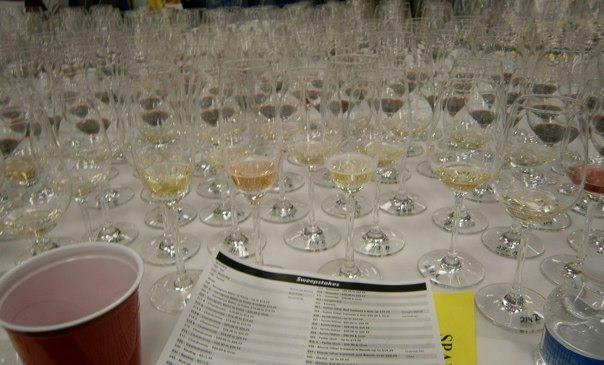 After all, if you tried to sample every wine there, you’d either be partying big time (or praying to the porcelain god). When you enter Vino California, they give you a booklet listing all of the wine being poured. All 126 pages. Sounds like a lot of vino but that’s actually only the names of the individual wineries. Many had three to seven wines each to taste. Contributor Carl Kanowsky sportin a Zaca Mesa cap! Clearly, this was an arduous task but I promised Eve I would persevere through. My assignment was eased by both the deliciousness of what was being offered as well as the comeliness of the winery representatives. Not everything I tried was wonderful. It never is at any wine event. There are always some bottles you would never buy on your own. But I don’t like writing about what I don’t like. Rather let’s talk about some of the gems offered. My hands-down favorite was Il Borro’s Rosso Toscano 2007, a powerful blend of Merlot (50%), Cabernet Sauvignon (40%), and, wait for it, Syrah (10%). Pepper, smokiness, and extremely well balanced. And, if you check wine-seacher.com, you can find it for just $35. Accompanying that was Pian Di Nova 2010, which was fetching both for its delightful taste as well as its good value. Tenuta La Parrina came in second with its Rosso Riserva 2005, 85% Sangiovese with a little Cab and Merlot thrown in. Another fine example of excellent wine at a good price of only about $30. Wine Advocate gave it a 90, a little stingy in my way of thinking. Both Il Borro and La Parrina are from Tuscany. Something of a surprise to me was some of the fine Piedmont wines. I have a pre-conceived notion that anything from Piedmont needs a few decades to unwind and become approachable. However, I did discover Coppo’s Pomorosso Barbera D’Asti 2008 to be drinkable now. This is a big, bold wine that needs a big, juicy steak to bring out all of its nuances. Overall, Vino California was a delightful introduction into what Italy has to offer. Based in Santa Margarita, winemaker Mike Sinor continues to craft well made wines at both the value and higher ends from the southern part of Paso Robles. The “Renegade” red blend was delicious. This Rutherford winery has a stellar reputation for fine wines. Not surprisingly, as their winemaker is Kirk Venge. My favorite was their flagship Cabernet Sauvignon (with a touch of Sangiovese). One of several Paso Robles wineries at the event, this is a fairly new one on the East side of Paso. The Syrah stood out for me. The Sierra Foothills are known for Zins, Syrahs, and the like. Also, my favorite California region for Barbera, and this winery delivered nicely on all of them. Well-priced and tasty wines from Napa. The ghost story was fun too. Mike and Chris Brown are leading the way in showing why a trip to Ventura can be as much fun as a trip to any other wine region, and a lot closer. Mike Officer’s amazing wines sell out every year, mostly to those of us on his mailing list. Yet he continues to support those who supported him early on, and that includes Family Winemakers. Another excellent producer from Paso Robles, Neil Roberts is great at showing what can be done to emphasize the local fruit without going over the top. Of course, it doesn’t hurt that Neil manages a couple dozen or so of the vineyards in the area, so he has a pretty good idea of which fruit to use. Collier Falls has always made great Zinfandel. And their Primitivo, which even though related to Zin has a completely different flavor profile, is terrific as well. Often overlooked with all of the new players in Paso Robles, Eberle continues to produce excellent wines under current winemaker Ben Mayo. 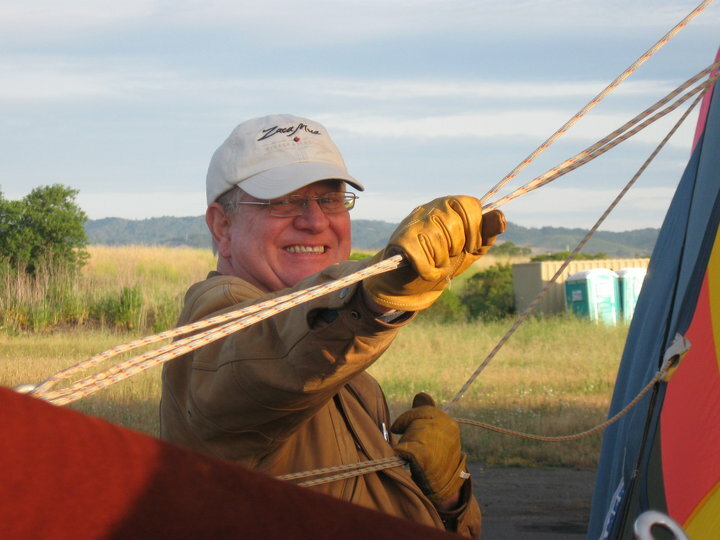 And those of us who love Syrah should give a big thank-you to Gary Eberle, because without him the story of California Syrah would likely have been a lot different, but that’s a tale for another day. Phil Staehle makes his wines in Sonoma in a style I prefer – it’s all about the fruit. Really loved the Petite Sirah, Syrah, and the red Rhone blend called Humbaba. If you don’t know who Enkidu is, check out the website or read the Gilgamesh epic. Another new to me Paso Robles winery, winemaker Andrew Jones works in his day job at a vine nursery, and has access to small lots of quality fruit. It shows! 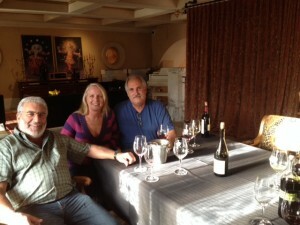 We visited Galante in the Carmel Valley several years ago, and they really made a positive impression. That feeling hasn’t changed – the Petite Sirah was especially tasty. 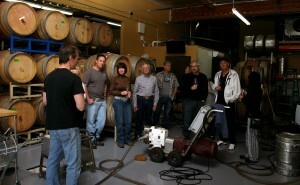 Jeff Cohn has been making his great wines in Oakland [!] since 1996. Wonderful Rhones and Zins. With three labels enabling them to cover a lot of price points, the Ballentine family does a great job producing wines sourced primarily from the San Antonio Valley AVA, which is in Monterey County [but really Northern Paso]. Pat Paulsen Vineyards [yes, that Pat Paulsen] is back! After being closed for 20 years, Pat’s son Monty took his UC Davis education and brought the winery back. It is in very good hands. 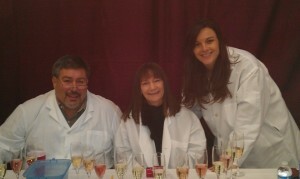 Winemaker Shauna Rosenblum continues the family tradition started by her father Kent. Excellent well made wines, I’m a big fan of their Zinfandel. Another Paso Robles winery, this one was recently featured in Wine Spectator as one to watch. Founded by two couples, these long-time friends are making some great wines. Of course, it doesn’t hurt that one of the friends is renowned Argentinean winemaker Santiago Achaval. All Zin, all the time. Making great Zins and Zinfandel-based blends is all Bruce Patch does, and he does it very well. 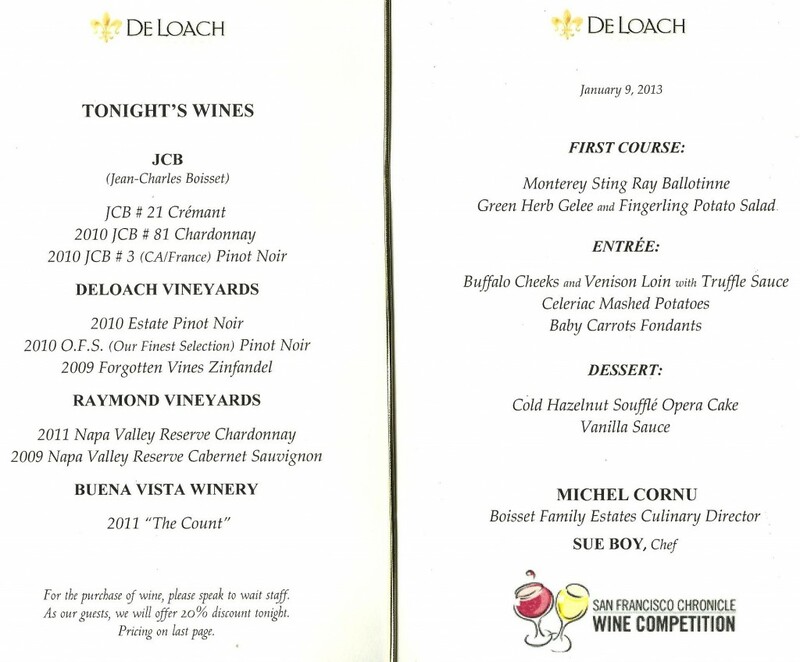 The above are just a fraction of the wines available to taste, making this event well worth the trip. Not all great wine experiences happen in Wine Country. But please remember that tasting and then dumping the rest of your glass (and even spitting), as well as noshing and drinking lots of water, is recommended whenever you go wine tasting to be able to get the most enjoyment and taste as many wines as possible. When was the last time you drove up to Agua Dulce Winery? Was it to picnic in or around the new gazebo with 10 dozen other friends (yes, the gazebo is that big), for a car show or maybe a wine club party? 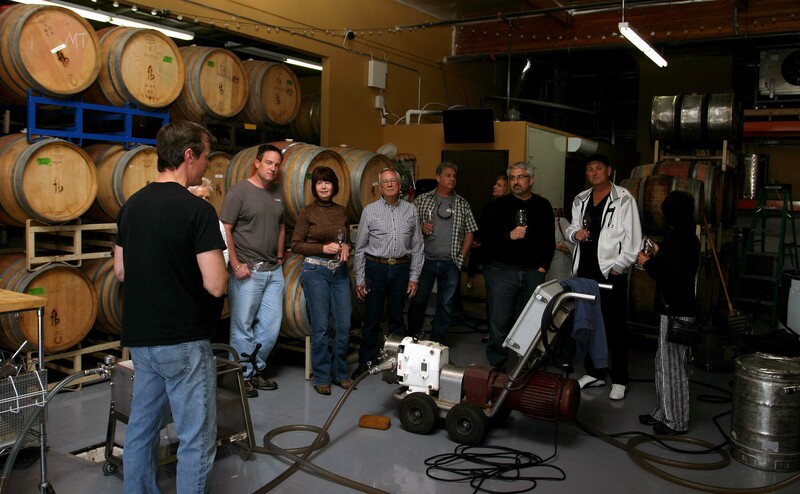 I was a member of the winery years ago, when it had different owners and was known as Agua Dulce Vineyards, and I looked forward to trying some of the new activities they have going on now, and this day we would be starting with Blending 101. Friends Kevin Norris and Don and Cheryl Dellepiane joined me for the day’s activity. We met in the tasting room – which was filled with happy wine tasters up and down the same expansive bar I remembered – and then were whisked off to the winery. Once in the cool barrel room we saw that our mad-scientist work areas had been set up: Large plastic pitchers of 100% Cabernet Sauvignon, Merlot, Sangiovese and Syrah; plastic vials that measured up to 25 ml; three wine glasses marked “A”, “B” and “C”; small paddles for stirring; black labels and silver markers. And of course, there were napkins for spilling, the necessary pour out buckets, water bottles to keep us hydrated, and crackers to cleanse our palates. Cathy MacAdam, assisted by two others, led the class. 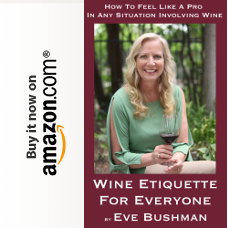 Cathy was like a wine-cheerleader – she waved her arms as she excitedly spoke about traditional wine blends, bent down to the concrete floor to explain the rich soil and constantly engaged the group asking us to share what we liked. Then we got down to the class. We were first to taste all four wines separately, to see what we liked but also to think about the varying characteristics of each; and how they might benefit by blending. Cathy instructed us to fill the vial no more than three times: 25 ml x three would be 75 ml in the glass and just the right blend to be duplicated in the 750 ml bottle. I set off right away with two parts Merlot to one part Syrah, then, getting into it, I tried two Syrah to one Merlot, two Cabernet to one Sangiovese and finally two Merlot to one Cabernet. While I stuck with only two varietals in my blending, others, like Cheryl and Kevin were mixing up to four, and of course, in less than 25 ml components. Using my little paddle I stirred each, and then swirled a bit more. Right off I noticed that all of the wines benefitted with blending. Sure, this was a mini version of what the professionals do, but I could see for myself why they do it. 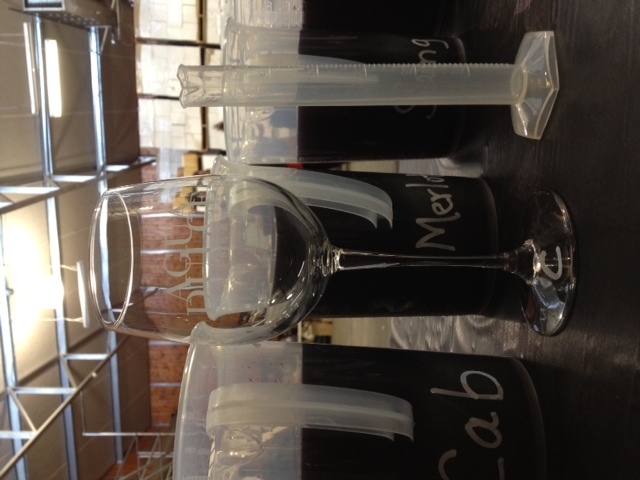 And how painstaking the process must be for a winemaker. 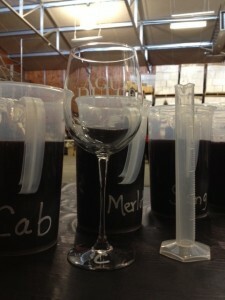 My favorite blend, to be duplicated in bottle, was the two Merlot to one Cabernet ratio. I asked Cheryl, who has better handwriting, to do my label for me. 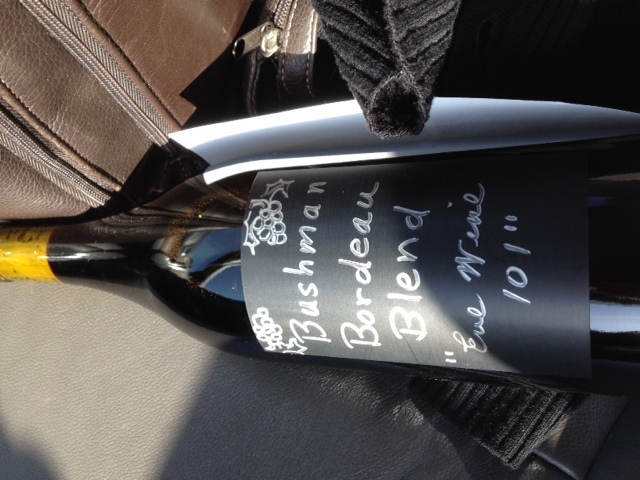 It now reads, “Bushman Bordeaux Blend, Eve Wine 101” – and she even drew two grape bunches on the top! We were all pretty much completed with our blending in an hour. Cathy then instructed us to join her up front where she would take the notes of our blends, and multiply them to fill a bottle. We then selected our cork – all of the corks were the same size, but they sure are bigger before they get squeezed into a bottle – and we used a big hand-corking machine to seal them up. We were to wait about 15 minutes for all of the bottles to be ready. 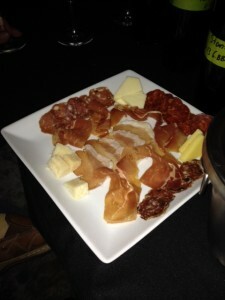 While the guests were prompted to return to the tasting room, where delectable sandwiches, cheeses, nuts and fruits had been laid out for us, I dragged my party to the grounds behind the tasting room. They hadn’t seen the gazebo before, and on this mild afternoon, several people were picnicking with their favorite Agua Dulce bottles. We then meandered into the vineyard where Cheryl noticed that the bud break had begun. For a long time I have been asked by the GOTN group to do a road trip for one of our monthly adventures. Recently, Gary Stewart (owner/vintner) of Four Brix Winery, offered us an opportunity to come to their tasting room and sample as well as educate us on the art of winemaking. Gary and his wife Karen are no strangers to GOTN as they attend whenever possible, schedules permitting. 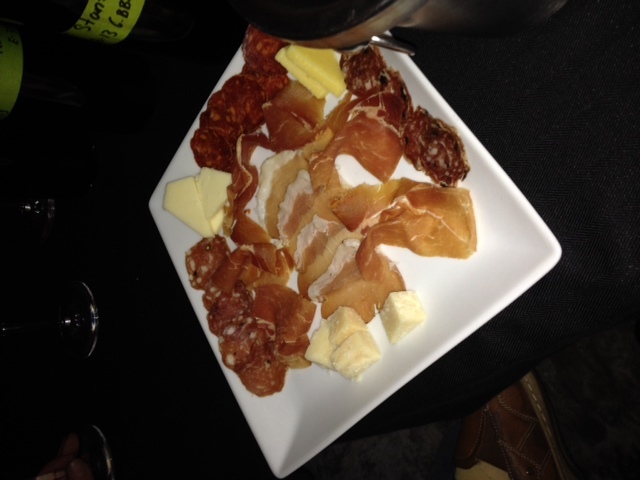 The day/night was informal with education intermixed with tasting wines that were recently released by Four Brix. 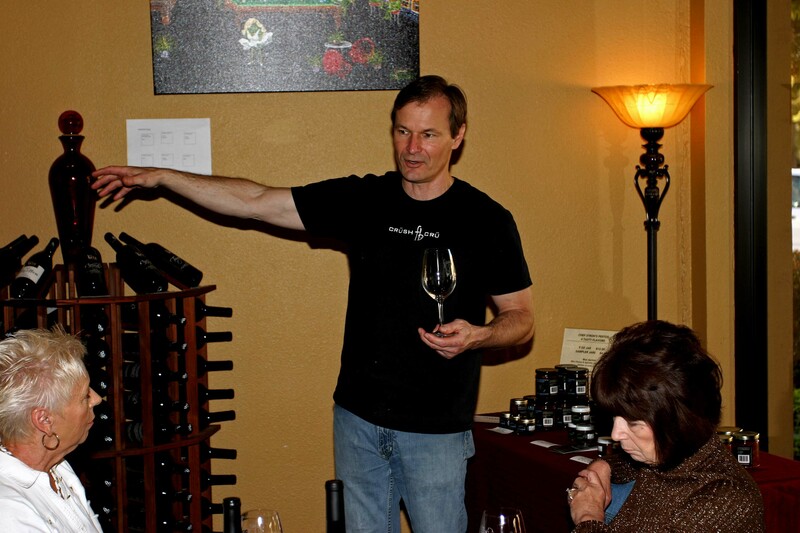 Gary was educated in the best ways possible when it comes to wine making and operating a successful winery. He was mentored in wine making which he reinforced by taking online courses from UC Davis, which has one of the best wine education curriculum in the country. It shows, Four Brix produces really good wine that is the result of trial and error as well as experience over the years. When Gary started out in his garage with another couple they bought inexpensive grapes at about $200/ton, which is very cheap as tons go. However, being new and not knowing they had the idea that the end product was in the process and not the grapes that makes the wine. After some input from successful wineries on wine quality based on grape quality/price he learned a new philosophy, GOOD GRAPES=GOOD WINE. He went back to his friends and said they had to buy better grapes to get better wine and next time spent $1000/ton. The difference was significantly noticeable. Today, he searches out the best grapes available for his wines. Later in his career, Gary met Ryan Horn from Justin Winery in Paso Robles who became his mentor. In 2007 Gary began importing equipment from France and Portugal. Gary worked with Ryan and together made many trips to Italy and Spain thus continuing his knowledge and skills in the old world wine making processes. It is because of these travels and experiences that led to the name Four Brix. Gary explained that “the winery name Four Brix pays tribute to the four wine regions we have traveled to and experienced the beauty, culture, and manner in which blended wine fits into everyday life: France, Italy, Spain and our home, California.” Brix refers to the amount of sugar in the grape juice. In talking to Gary about his path to where he is today, one realizes quickly that his passion is to share and watch people enjoy what wine is all about. To me it is not difficult to refer to wine lovers as a cult. To verify this statement go to a gathering or wine bar and see how people review and strive to understand the artistry that the vintner put into the bottle for us to enjoy. We are not talking about people that are drinking for effect but the ones that are dissecting the wine to see it change over time as oxygen infiltrates the glass and the fruits and spices that come to one’s nose via the aromatics. This is then followed by the taste on the palate where the flavors explode (California wines) or lay subtle in layers of complexity (French and Italian wines). This is how I see Gary’s view and passion for wines. 2011 Smitten – Viognier from Camp 4 Vineyard in Santa Ynez. Beautiful Green apples and grass that you expect from this style. Crisp and exciting. Grenache Blanc – Pulled from a barrel. The barrels used were purchased from Silver Oak Winery and are American. These barrels imparted a buttery and creamy profile to the wine. This was very evident in this wine. Very good. 2009 Temptress – 44% Tempranillo, Mourvedre, Grenache and Graciano. 2010 Rhondezvous – Grenache, Syrah, Mourvedre and Counoise. 2010 Scosso – 64% Sangiovesse and 26% Cabernet Sauvignon and 10% Merlot. This wine was given 89 points by Wine Spectator. Excellent wine. The day was interesting with group questions ranging from general to technical. I was extremely happy by some of the technical questions about various strains of yeast as well as their alcohol tolerance. I never expected these types of questions from the group. Maybe I am rubbing off on them as they are really looking at the details of what goes into producing fine wines and how much difficulty there is to being consistent and repeatable. 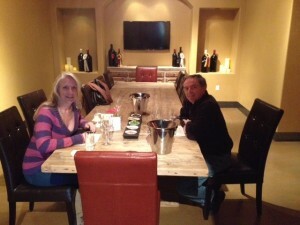 I also want to add a quick note about another Ventura Trail Winery that Gary recommended that I visit. It is called Plan B and has only been open since October 2012. It is owned by Marlow and Janis Barger. They had five wines open for tasting, a 2010 Mourvedre, 2010 Grenache, 2010 GSM, 2010 Shiraz and a 2010 Syrah. My two favorites were the Mourvedre and the Grenache. Typically you see these wines in blends, if not blended they can be touch and go if they are enjoyable as a single varietal. These two wines from Plan B were light and very good. Though lacking in a long finish, they made up for in a nice clean enjoyable sipping wine. 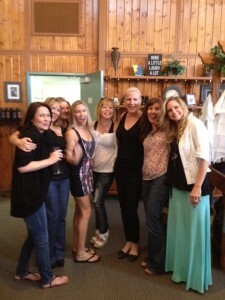 The Mourvedre was my favorite as well as Tracy’s, her brother Mitch and his new wife Jan. It was especially fun for Mitch and Jan as Plan B was their first wine tasting ever. 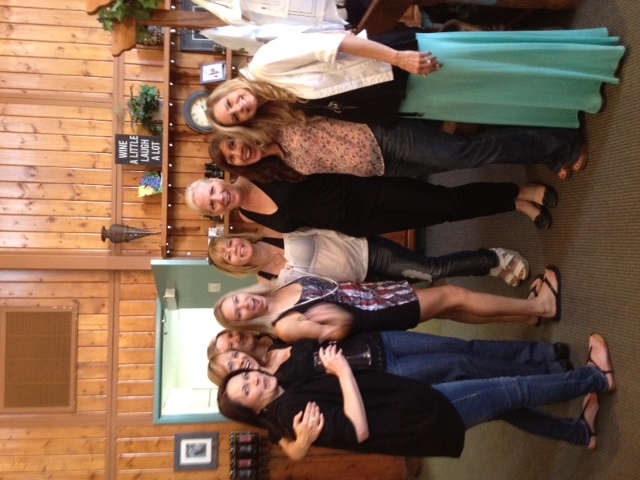 To sum up the experience, everyone needs to try the wineries on the Ventura Wine Trail. It is quite evident that they are on track to becoming recognized wineries. Four Brix has already done this by gaining recognition from Wine Spectator, 89 points for their 2010 Scosso. They also have a large group of dedicated followers. I hope that this article entices you to try these wineries, they are definitely worth the trip. They also make you feel like a family member and good friend as soon as you walk in. I know Gary has always made me feel that way and he is all about making and educating people on wines in hopes that they find and share his passion. Four Brix is about blends at the moment, but they live up to their motto, “Not just another brix in the wall.” They want to explore and push the limits of wine making and production through creative blending practices. Visit them, you will not be disappointed and tell them Rusty sent you. Don’t you just love it when you have an interest in something and out of the blue a great opportunity to learn and experience it just falls into your lap? I sure do and I had such an event happen just a couple weeks back. The interest??? 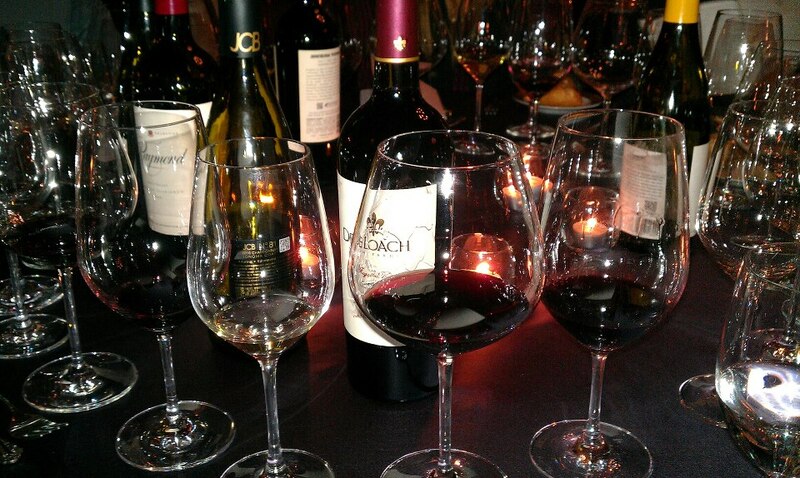 California wines made from Italian grape varietals grown throughout the state. You know, wines made from grapes like Sangiovese, Barbera, Teraldigo, Fiano, Vermentino, Aglianico, Arneis, Lagrein, Nero d’ Avola, Primitivo, Trebbiano, Dolcetto and many more. Maybe you don’t know about many or any of these varietals, possibly the only wines you may be familiar with are Chianti (mostly Sangiovese) or Lambrusco. No matter what, I am here to encourage you to look beyond your normal wine choices and consider the diversity that the influx of Italian varietals planted in California is bringing to the palate of the wine consumer. Ah, now you may be wondering what event spurred this push towards the Italian varietals. 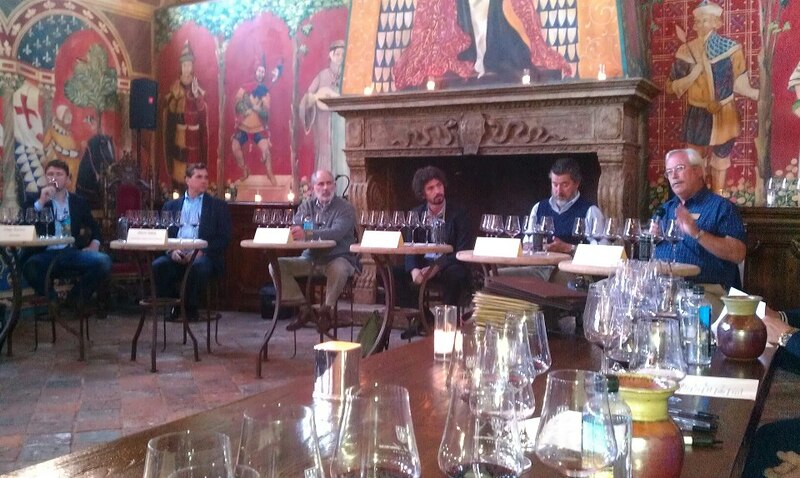 On February 4th, I attended a forum on the Trends in Italian Varietals in California, presented by Dario Sattui and his staff at the Castello di Amorosa. Before I discuss the forum, I have to say that being on the Castle grounds is a treat. 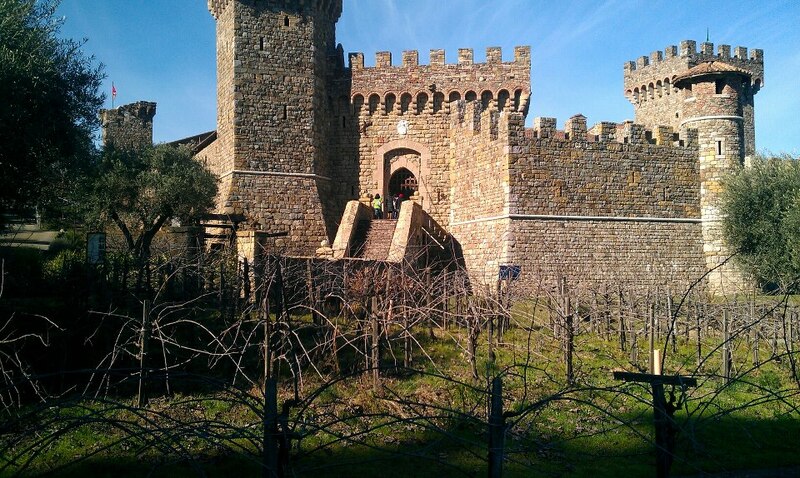 The beauty and detail that make the Castello di Amorosa facility so spectacular are definitely worth seeing. The architecture, the artwork, the beauty of the upper portion of the Napa Valley all combined into a wine making facility is worthy of a visit, if for no other reason than to let the child in you that always wanted to live in a castle experience the fantasy. I took a little time in advance to re-familiarize myself with the castle grounds, having visited in the past, before heading to the amazing Great Hall of the Castello di Amorosa for the forum. As I entered I was greeted by Jim Sullivan, the VP of Public Relations and Marketing and then was introduced to the owner, Dario Sattui. I had the opportunity to discuss their recent successes at the San Francisco Chronicle Wine competition, where among other awards they received the Sweepstakes award for the best dessert wine of the competition (2011 Late Harvest Gewurztraminer). While meeting and greeting with the staff, owner, the panel and media participants, we all enjoyed their Sangiovese and the their 2010 Dry Gewurtztraminer. After a short hospitality session, everyone proceeded to take seats and the forum began. Initially, all the participants were given a very gracious welcome by Dario Sattui and Jim Sullivan before moving directly to the forum. Now the focus of the forum was a six person panel addressing questions pertaining to where Italian varietals are today and where they are headed in the future. The gentlemen making up this panel were Diego Barison of NovaVine, Glenn Salva who is with Antinori California and Antica Napa Valley, Bob Pepi with Andretti Winery, Marco Bertacinni of AEB Group, Sebastiano Rosa of Agricola Punica/Castello di Amorosa, and Brooks Painter winemaker for Castello di Amorosa. These individuals brought substantial experience and knowledge garnered from around the world, but specifically in Italy and California. Their combined background made for a very illuminating afternoon. The following are brief summaries of some of the topics addressed during the afternoon. 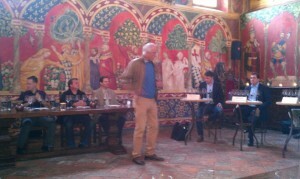 • The discussion started around which are the most successful Italian varietals in California. (Initially addressed to Diego Barison) The response included a number of varieties like Barbera, Sangiovese and included Aglianico, Fiano, Vermentino and Teraldigo. It was also mentioned Fiano, Teraldigo and Montepulciano do well considering they are producing wines that have higher acidity levels. Throughout the day’s discussions the differences in climate, soils, farming techniques and other challenges were frequently mentioned as issues to face in expanding the planting of and wine producing from Italian Varietals. • The second major question addressed comparing Italian Sangiovese based wines versus those made in California. (Initially addressed to Glenn Salva) Sangiovese arrived in California in mostly in 1986 and now has over 500 acres planted. The general belief seemed to be that there has been a big learning curve. Sangiovese is much different in Italy, there are different clones and wines made from these grapes. In California it is much more limited in focus and the diversity of wines being made. • How has he (Bob Pepi) modified Sangiovese Production in his winemaking efforts. Mr. Pepi stated that they began working with Sangiovese in 1981 and were planting the varietal on a rock outcropping with very poor soil, but ideal for grapes. He maintained that bad soil creates great fruit. He added that his production focuses on minimalistic wine making, up to a year in the barrel and implied that Sangiovese does well east of the Silverado Trail in the Napa Valley. Bottom line, less is better. • What are the trends in winemaking in both Italy and California? (question posed to Marco Bertacinni) Marco believes that wine makers want to make great red wines, but feels that the alcohol content is not as important in Italy as it is in California. Additionally, he feels that more effort is being made to produce more aromatic white wines in both areas. Because of these efforts he felt there is an emphasis on finding yeasts that help develop the aromatics in white wines, additionally to find yeasts that can work well in more difficult fermentation situations. 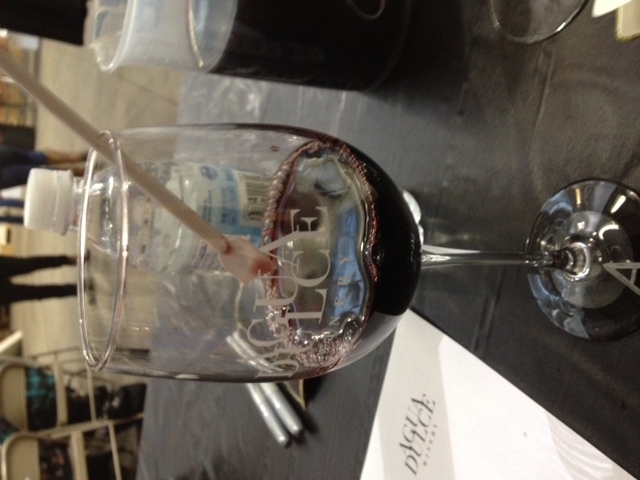 • Will your style change to make Napa based Italian Varietal wines? (posed to Brooks Painter) He stated that California is distinctly different than Italy when it comes to the farming aspect of wine making. He feels it is difficult to be able to duplicate the acidity in the wines from Italy. Brooks added that the gentle handling of the wines in farming and production will be important and that there is a steep learning curve to be overcome to produce quality Italian varietals in California. • As the forum continued, the issue of higher alcohol contents in California wines seemed to be a constant concern, along with the acidity levels associated with Italian Wine. The climate in California is definitely more conducive to higher sugar levels, which translates to more forward fruit and subsequently greater alcohol levels. The way to mitigate this is to find niche locations to farm the grapes that will allow them to be produced in a similar environment to Italy. •In Italy, wines tend to show a much better acidity and finesse. The challenge will be to reach the consumer in both the United States and California to open their palate to these styles of wine. 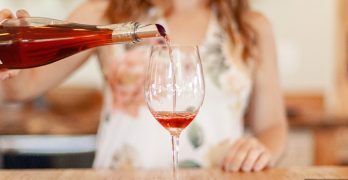 Currently, the American consumer is not a big fan of greater levels of acidity in their wines and the best way to educate the consumer palate is to make the efforts to pair the Italian varietals with food. •It was evident that all the panel members were basically in agreement on these issues — especially the challenges of enlightening the consumer palate to the joys of Italian style wine. Summarizing the forum, it was apparent that all participants felt Italian varietals had a great potential in California. The major challenges highlighted were farming, production issues and most significantly the lack of interest in higher acidity and lower alcohol by the consumer. All in all, this was a wonderful opportunity to hear from experts about the potential of wine grapes from the old world as they develop in California. •I do want to take a moment to thank my hosts Dario Sattui, Jim Sullivan and especially Julie Ann Kodmur for including me on their invitation list for this event. The forum was fantastic, the facility amazing and the food and wine were excellent. • Antinori Tiagnello 2009 – Cherry, smoked sausage wonderful acidity. • Bray Vineyards Barbera 2010 – Minerality, earthy, cherry and dark fruit. • Barrua 2009 – Spicy, cranberry/candied fruit, nice acid, expanding, great finish. • Castello di Amorosa La Castellanna 2008 – Red fruit, complex and long finish. 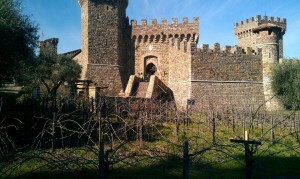 • Castello di Amorosa Sangiovese 2009 – Forward cherry, spicy and good balance. In closing, all I would like to do is ask that you give some Italian Varietals made in California a chance. Try something new and see what you think, my bet is that you will be surprised……greatly. As always, Life is Too Short to Drink Bad Wine, so go out this week and give the Italian Grapes a shot! You could find a new favorite!!!! Rick Fraga has been chasing down all things wine for over 30 years as a consumer and over 20 years working in various aspects of the wine industry. His introduction to wine started in the US Army in Germany, continued with the help of his father and a sizable group of vinophile friends — over the years it has grown to an obsession. After toiling as a management “cubicle life-form” for over twenty years, now Rick’s passion for wine has him fully involved in the wine industry. Currently, he is on staff at Martinelli Winery and Vineyards, providing education, hospitality and retail services. He is also a member of the AgBusiness/Wine Studies Advisory Committee at Santa Rosa Junior College. 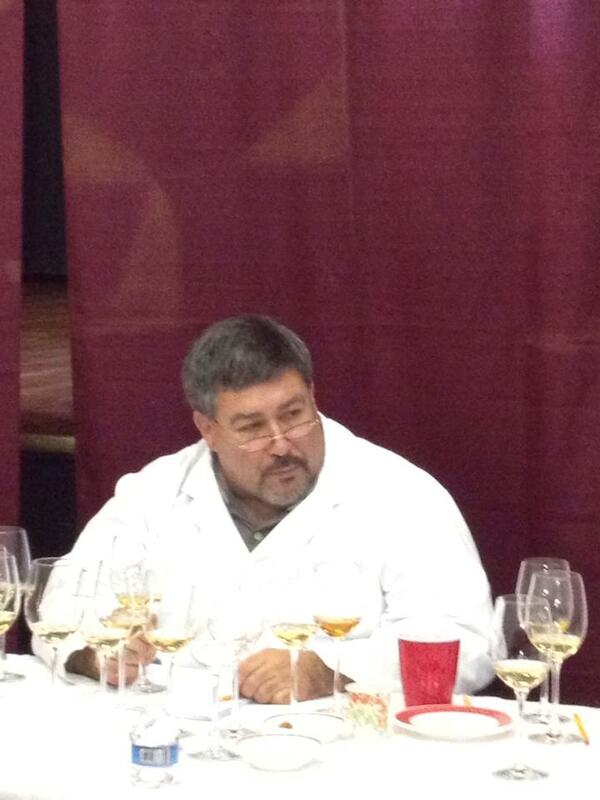 Rick is a professional wine judge and writes a blog pertaining to all things wine called Gateway To Wine. Finally, due to a fortuitous meeting with a fellow wino, Michael Perlis, at a notoriously great food and wine spot in Las Vegas, he has become an occasional contributor to Eve’s Wine 101. He is hoping to continue in the wonderful of wine until he can no longer climb out of bed. If you would like to see Rick’s blog, find him at gatewaytowine.com or contact him at gatewaytowine@gmail.com.